Visit Musser Park on any given Sunday this Summer and you'll find a bustling market full of fresh produce, local goods, and smiling faces. 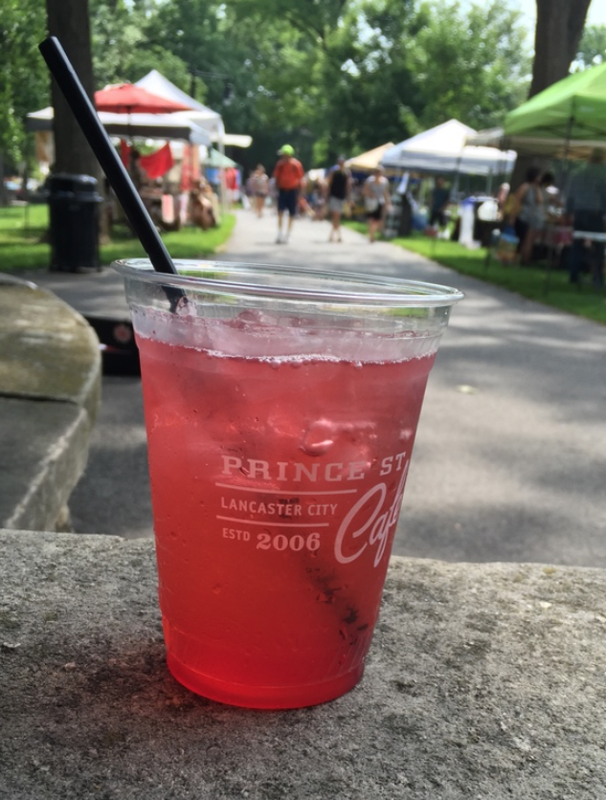 Lancaster East Side Market has proven to be an excellent venue to showcase our refreshing seasonal shrubs. From strawberry-basil to watermelon-mint, it's a joy to offer up local ingredients that not only taste great, but have additional health benefits. Simply put, a shrub refers to sweetened vinegar-based syrup infused with fruit juice, herbs, and spices that can be mixed with carbonated water (or spirits if you're feeling adventurous) achieving a flavor profile similar to that of Kombucha. Most of our shrubs are made with Apple Cider Vinegar, which as it turns out, has countless beneficial properties and is believed to help support the heart, fight infections, lower blood pressure and cholesterol, reduce chronic fatigue, help with weight loss, detoxify and cleanse the body, and even whiten teeth. The best thing about shrubs, however, is that you can make them with just about anything! Below you'll find a great Apricot-Ginger Shrub recipe, for example. Don't want to make your own? Stop by our market stand or cafe to try our latest creations. Combine apricots, cardamom, ginger, vinegar and sugar in a mixing bowl, stirring until the sugar has dissolved. Cover with plastic wrap and refrigerate for 1 week, stirring occasionally. Taste for flavor; add sugar as needed. Press the mixture through a fine-mesh strainer placed over a bowl or through a colander lined with cheesecloth seated over a bowl. Discard the solids. Transfer the resulting liquid to a bottle large enough to hold 3 cups. Seal and refrigerate. Shake before using. Add 2 ounces of shrub for every 4 ounces of water or soda and serve over ice.